Water mostly enters a tree through the roots by osmosis and any dissolved mineral nutrients will travel with it upward through the inner bark's xylem (using capillary action) and into the leaves. These traveling nutrients then feed the tree through the process of leaf photosynthesis. This is a process that converts light energy, usually from the Sun, into chemical energy that can be later released to fuel an organisms' activities including growth. Trees supply leaves with water because of a decrease in hydrostatic or water pressure into upper, leaf-bearing parts called crowns or canopies. This hydrostatic pressure difference "lifts" the water to the leaves. Ninety percent of the tree's water is eventually dispersed and released from leaf stomata. This stoma is an opening or pore that is used for gas exchange. They are mostly found on the under-surface of plant leaves. Air also enters the plant through these openings. The carbon dioxide in the air entering the stoma is used in photosynthesis. Some of the oxygen produced is used in respiration through evaporation, into the atmosphere. That beneficial loss of water from plants is called transpiration. A fully grown tree may lose several hundred gallons of water through its leaves on a hot, dry day. The same tree will lose nearly no water on wet, cold, winter days, so water loss is directly related to temperature and humidity. Another way to say this is that almost all water that enters a tree's roots is lost to the atmosphere but the 10% that remains keeps the living tree system healthy and maintains growth. Evaporation of water from the upper parts of trees especially leaves but also stems, flowers and roots can add to a tree's water loss. Certain tree species are more efficient in managing their rate of water loss and are normally found naturally on drier sites. An average maturing tree under optimal conditions can transport up to 10,000 gallons of water only to capture about 1,000 usable gallons for the production of food and adding to its biomass. This is called the transpiration ratio, the ratio of the mass of water transpired to the mass of dry matter produced. Depending on the efficiency of the plant or tree species, it may take as little as 200 pounds (24 gallons) of water to 1,000 pounds (120 gallons) to make a pound of dry matter. A single acre of forest land, during the course of a growing season, can add 4 tons of biomass but uses 4,000 tons of water to do so. Roots take advantage of "pressures" when water and its solutions are unequal. The key to remember about osmosis is that water flows from the solution with the lower solute concentration (the soil) into the solution with higher solute concentration (the root). Water tends to move to regions of negative hydrostatic pressure gradients. Water uptake by plant root osmosis creates a more negative hydrostatic pressure potential near the root surface. Tree roots sense water (less negative water potential) and growth is directed towards water (hydrotropism). 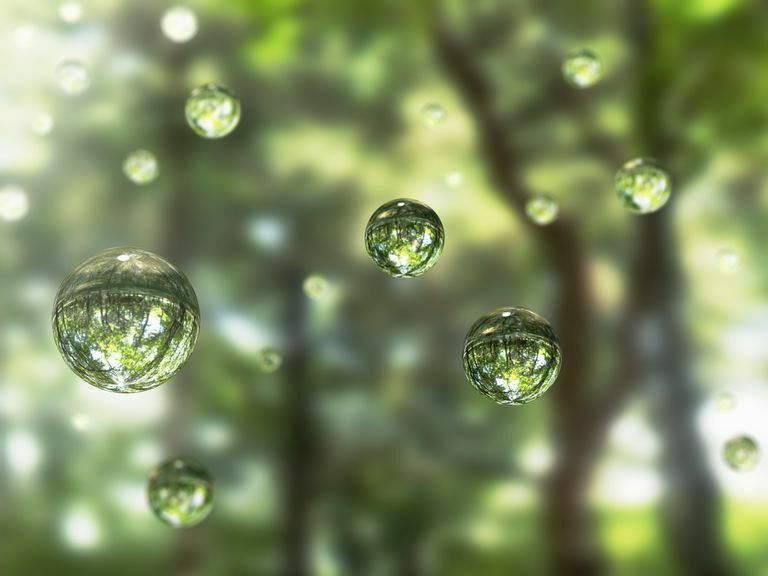 Transpiration is the evaporation of water from trees out and into the Earth's atmosphere. Leaf transpiration occurs through pores called stomata, and at a necessary "cost", displaces of much of its valuable water into the atmosphere. These stomata are designed to allow the carbon dioxide gas to exchange from air to assist in photosynthesis that then creates the fuel for growth. We need to remember that transpiration cools trees and every organism around it. Transpiration also helps to cause that massive flow of mineral nutrients and water from roots to shoots which is caused by a decrease in hydrostatic (water) pressure. This loss of pressure is caused by water evaporating from the stomata into the atmosphere and the beat goes on.